The western world has long been clinging on to the notion that Chinese industry, and the Chinese motor industry in particular, is very much behind the times. We have decided that quality is very low, and the engineering design is still at the horse-drawn wagon stage. Unfortunately, we have been fooling ourselves. With our complete faith in the westernized ‘Detroit of Asia’ concept, which could not be threatened by anyone, our dominance was so complete that we did not hear the Chinese creeping in the back door. If you have any doubts, I suggest you take a trip to Bangkok and visit the 30th Bangkok International Motor Show being held at the BITEC exposition halls between March 26 and April 6 this year. With Thailand’s ‘Detroit of the East’ manufacturers GM and Ford currently facing the world economic downturn and teetering on the verge of bankruptcy, some of the established players in auto retailing are looking to China to boost the bottom line. Ponder on the fact that China outsold the US for the first time in January 2009. The Yontrakit Group, a long time player in the Thai auto market has been split in three to allow them to concentrate on importing some Chinese vehicles, both a completely built up (CBU) and as CKD. One of the Yontrakit trio is Thai Yarnon which will bring in the Chery brand from China, to sell alongside its VW outlets. The Chery will get its first showing at the Bangkok International Motor Show. The Chery QQ sub-compact will be brought in initially CBU, but with Yonytakit having assembly lines free, this will mean that the Chery models (QQ, Tiggo SUV and Cross MPV) can later come in CKD. The Yontrakit Corporation is continuing to bring in the Naza Forza, a Chinese manufactured vehicle being assembled in Malaysia and brought in to Thailand CBU. Whilst sales have been less than hoped for, the settling down of the Yontrakit empire, now split in three, will see more aggressive marketing in 2009. Swelling the Chinese import ranks is the Wuling Scorpion under the aegis of the PVA Motors group, and DFM Mini trucks manufactured by Dongfeng Motor in China and brought in CBU. DFM Thailand is looking to sales of 2,000 units this year, and with the vehicles retailing at between B. 270,000 - 320,000, there will be plenty of interest by small businesses. DFM is projecting 20 dealer outlets by the end of 2009. With China also being first with an all electric production vehicle (the BYD - Build Your Dream) and GM putting back the release of the Chevrolet Volt, you can expect China to be attacking the market on all fronts. Whilst nobody in Bangkok will deny the downturn, Thailand is obviously looking to its neighbor in the north to counteract flagging markets. Last week I asked which car company was first with the key start. The answer was Chrysler in 1949. How a once proud automaker has crumbled. Walter P Chrysler must be revolving in his grave. So to this week. You could still get wooden wheels as factory equipment in 1939. What manufacturer (of the car)? Honda Motor Co., Ltd. has announced the sale of the Honda Racing F1 Team to Ross Brawn, the former Team Principal of Honda Racing F1. The entire shares of HRF1, held by Honda GP Holdings Ltd., the UK-based holding company for HRF1 that managed all operations of Honda’s F1 racing, were sold to Ross Brawn. As a result of this sale, the team ownership has been transferred to Mr. Brawn, who has stated the new team will compete for this year’s FIA F1 World Championship. This has brought to a close the very protracted sale of the Honda F1 company, which rumor has it, is still being supported by Honda, but in the background only. 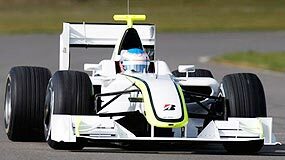 The newly purchased team is known as Brawn GP and the two drivers from 2008, Jenson Button and Rubens Barichello, have both been retained, and we will see during the 2009 season just which driver will be dominant. I will predict that only one of them will be retained for the 2010 season. Last year the veteran Barichello had a much better year than his younger team member. In testing so far, the new Brawn GP1 has been very quick, straight out of the box, and if pre-season testing is anything to go by, the new car will be in the top half of the field, as opposed to being tail-end charlies as they were last year. In fact, the new BrawnGP car, in the hands of Rubens Barichello, recorded the fastest time this year at Barcelona, and was over two seconds quicker than Lewis Hamilton in the McLaren. The 2009 season begins in Melbourne on March 29. BKK International Motor Show March 27 to April 6. Is GM about to go belly up? Much space in the financial pages as to whether GM will go to the wall. That covers GM in the US and GM in Europe. Simple answer - GM will not disappear like British Leyland 30 odd years ago, but financially it might be better for it to claim bankruptcy protection through Chapter 11 provisions. This would allow the US appointed managers to deal more effectively with creditors, unions and suppliers. Propping up the ailing companies with more and more government funds may just be throwing good money after bad, unless GM can show how it is going to turn itself around. This scenario has already been mooted by GM, whose spokesman stated, “We could be forced to seek relief through a filing under the US bankruptcy code.” Its auditors have also said there is “substantial doubt” about its ability to stay in business if it fails to stop its losses, with Deloitte & Touche reporting a loss of nearly USD 31 bn for 2008. The cold hard truth is that there will be massive losses yet to come in the auto industry. Car sales in the US have fallen 40 percent from their 2007 peak, while global sales are down about 24 percent from a peak in January 2008, GM said. GM’s shares dropped 17 percent to $1.82 on the New York Stock Exchange as investors reacted to the news. For GM, the only question is how to cover these losses while it restructures itself. Chapter 11 may just be the best way out yet. I was asked the other evening about ‘supercars’ and which did I think was the best. Perhaps I am getting old, but I have rapidly come to the conclusion that ‘supercars’ do absolutely nothing for mere mortals such as you and me, and have become increasingly more irrelevant today. I am reminded of Professor Max Born’s statement, “Space travel is a triumph of intellect but a tragic failure of reason.” You can say the same about today’s ‘supercars’. So VW managed to extract 1001 horsepower from the engine in a Bugatti Veyron. Why? What earthly good is that for you and me? A triumph of intellect and a tragic failure of reason. 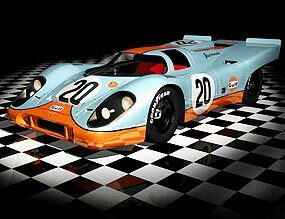 However, if you do want to discuss ‘supercars’, make sure you include the Porsche 917. 40 years old, it was first displayed at Geneva on March 12, 1969. Despite initial instability problems at speed, an intense development program through 1969 saw the car ultimately developed into one of the most successfully race cars of all time. It went on to win Le Mans in 1970 and returned in ’71 with the Martini and Gulf-Wyer teams to completely dominate the event. What sort of performance was available 40 years ago? The Long Tailed Le Mans racer was capable of 0-100 km/h in 2.5 seconds and a top speed of 406 km/h. For the 1973 Can-Am series, a turbo-charged version was produced; developing 820 kW in race tune and 1180 kW in qualifying tune (that’s 1,580 bhp). This version, the 917/30 could accelerate from 0-100 km/h in 1.9 seconds and 0-160 km/h in 3.9 seconds, hitting a top speed of 414 km/h. If you want one of these classic supercars, the Porsche 917 is one of the most significant race cars of all time with current (2009) values at between $3 million to $7 million. Britain’s Allan McNish debuts R15 TDI on March 21 at Sebring (US), as preparation for Audi’s next diesel LMP1 race car running up to Le Mans this year on June 13/14. AUDI AG is the world’s first automobile manufacturer to develop a “second” generation diesel racing sports car. Audi aims to underline its supremacy and consolidate its expertise in car technology once more at the legendary 24 Hours of Le Mans with the all-new Audi R15 TDI. Audi Sport has developed a new LMP1 race car that differs significantly from all previous Le Mans sports cars. “The R15 TDI has many detailed technical solutions never seen before on a sports prototype,” explains Head of Audi Motorsport Dr. Wolfgang Ullrich. The engine is a newly developed V10 TDI engine producing more than 600 hp, with a maximum torque output in excess of 1,050 Nm and which reflects the latest version of the TDI Technology invented by Audi. The power unit is more compact and lighter than the twelve-cylinder engine used in the preceding R10 TDI model. The specific fuel consumption and associated CO2 emissions could also be reduced. The vehicle electrical system in the Le Mans sports car is entirely new. A lithium-ion battery, as found in some hybrid vehicles, is used for the first time. It is lighter than a conventional battery and supplies a higher voltage. The headlights fitted to the R15 TDI also benefit from the higher power. At Le Mans, Audi competes for the first time with a low beam unit comprised entirely of light emitting diodes, which represents the next generation of Audi LED technology for road cars. Audi is the only automobile manufacturer to have won the famous 24 Hours of Le Mans with a diesel car. “With the R15 TDI we have created the base to be in a position to win also in 2009,” says the Head of Audi Motorsport Dr. Wolfgang Ullrich, in a most confident mood. However, anything can happen in motor racing. We shall see what happens when the flag falls in France.